A while ago I announced that, as part of my “Ecovillage L.A. 2066” project, I would review the 2012 edition of Paul Glover’s book Los Angeles: A History of the Future, initially published in 1982. Instead, I now have the pleasure and the privilege of publishing this guest post by Paul himself, in which he details his vision for Los Angeles on the basis of the ecovillage paradigm, and offers an example taken from an initiative with which he is involved in Philadelphia, Pennsylvania. In doing so, he significantly enhances our understanding of the basics of perma-circularity – even though he doesn’t use the term himself. 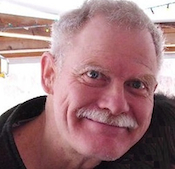 Paul Glover is a famous community organizer, probably best known for being the creator, in 1991, of “Ithaca HOURS” in New York, one of the United States’ oldest functioning community currency. He is also the founder of the Philadelphia Orchard Project as well as a dozen other organizations and initiatives. His website can be visited at http://paulglover.org/. I’m convinced this text will soon be recognized as foundational by many of us who are seriously engaging with perma-circularity and its implications for city and settlement design. Total transformation is the Los Angeles style. Just two hundred years ago, this place sheltered hunter-gatherers who danced the porpoise dance. Within sixty years they were trampled by Latinos and their half million cattle. Thirty years later, Anglos evicted the Spaniards and plowed up pasture for wheat. Thirty years after that, the wheat yielded to giant orchards. Another fifty years saw this food torn out for factories and homes. The latest thirty years have raised skyscrapers, superhighways, and a new Latino majority. This eighteenth most populous spot on earth (and the US’s second largest metropolitan area) has killed Nature. Environmental protection means chaining a dog in the yard. Brown air turns every clean, pink lung gritty yellow. Trees endure like parsley on an empty plate. Fertile soil lies smothered under asphalt. Here is the American metropolis supreme: Water is imported across hundreds of miles of dry land in the world’s longest aqueducts; fuel arrives through some of the world’s largest, longest electric wires, transport routes, and pipelines, sparking 4,800 square miles of humans; food is trucked daily hundreds of miles to America’s largest wholesale market, on Central Avenue, serving an appetite larger than most world nations’; metal is extracted worldwide, forging products for consumers who consume for the pleasure of consumption. Another transformation is due. Los Angeles is an army camped far from its sources of supply, using distant resources faster than nature renews them. As the burgeoning populations of Western states stake claims to their own lands, L.A.’s grip weakens. Thus the city reaches farther and farther for coal, to replace petroleum; farther for natural gas, because Texas wells have peaked; farther for soil, the food of food, as millions of acres yearly are paved for suburbs and scalped by monocropping; and farther for water, to slow our increasing vulnerability to drought. As other needy cities compete for these limited treasures, a hazard looms. Angelenos will eventually lose the political leverage which brings essential wealth here. There is such potent soil under the pavement that this county was the greatest garden in the United States, the top food producer of all counties, between 1910 and 1950. The sun shines on this place 290 days yearly. A growing season 350 days long permits continuous harvest. The 13.5 million people in the L.A. metropolitan area can work together. Skins all shades of night and smoke, of soil and wood, of fire, seashells and sand cluster and mix on the plain. They resent and love and hurt and help each other. They are magnificent. Water under this desert gives half the amount now used countywide. The ocean desalted is an endless supply. How does Los Angeles begin to employ these strengths to create a fruitful, self-reliant city, a sensual city worthy of excellent people and land? How do the L.A. area’s inhabitants prove the region’s resources can sustain them? The first work of citizen planners would be to redesign Los Angeles just as boldly as government and industry do – to plan transformations with solar technology and orchards in just the same way that commerce plans with highways and realty. They would plan broadly enough to coordinate regional use of our resources and flexibly enough to rely on initiatives by individuals and neighborhoods. The group called Citizen Planners in Los Angeles, created in 1983, recommended that neighborhoods inventory their resources and create preliminary designs to best juxtapose homes with croplands, solar turbines, water mains, and solar freight rail. Natural resources would be used at the rate they naturally renew. This is the heart of ecology. Food and fuel would be produced at household, neighborhood, municipal, and regional levels. This is the heart of social cohesion. The economy would become a “mutual enterprise” system. Work would be apportioned to enable all to labor. This is the heart of dignity. Culture would become decentralized and participatory, releasing the creative genius in everyone. This is the heart of joy. Food: To produce within homes, neighborhoods, and cities of this region all food eaten here. To create high-quality vegetarian diets by organic cultivation. Water: To bring the most water for the most necessary purposes from the shortest distances with the least use of fuel. Fuel: To reduce fuel demand and to power all homes, vehicles, and machines from the sun. To use wind, wave, muscle, and municipalized petroleum in reserve. Housing: To craft solar greenhouse homes of many types, designed by residents to fuel, feed, and delight themselves, and which are part of beautiful, self-reliant neighborhoods. Solid waste: To reduce waste to zero by producing durable essentials and by recycling everything. Industry: To produce durable essential tools from raw materials of this region, in neighborhood shops owned and managed by workers. Angelenos learn to luxuriate in the necessities before the necessities become luxuries. Transport: To satisfy physical and emotional needs within walking distances. To reduce transport to zero by producing goods where they’re used. Move any raw materials, essential goods, and people by foot, pedal, and solar rollers. Transportation is a waste product. Culture: To encourage a decentralized participatory culture expressing the bounty of the planet and of this region, the beauties of its people, and their pride in working together to build and enjoy a sensual city. Such a Los Angeles could happen, and it’s already happening. A Santa Monica neighborhood, for instance, was already seen in the early 1980s to evolve toward self-sufficiency, and I describe this mutation in detail in my book. The process may take ten, twenty, or fifty years. Entire cities such as these can grow through trust between neighbors. Basic to the process is the paradigm of the ecovillage. An ecovillage maximizes personal and social satisfaction while minimizing the resources needed to provide food, shelter, clothing, transportation, toys and tools. It uses local recyclable materials to the greatest possible extent and produces no garbage. Still, the construction of the ecovillage will inevitably destroy some homes of plants and animals and will do some damage to soil. Therefore, ecovillagers will eat, work, clean, play, sleep, heal, clothe, move about, and be sheltered so they replenish what they take from nature. Here are some of the basic principles and practical aspects of the ecovillage paradigm. The Los Angeles Ecovillage, an urban eco-settlement right in central L.A.
Eat: Maximum food is produced onsite via organic dwarf and espaliered orchards, grain fields, and gardens, with berries and wild foods. Greenhousing is provided for tropicals, hydroponics, and seedlings. Integrated Pest Management is used. Increased genetic diversity is developed. Shade crops are planted in atria. All food purchased offsite is unpackaged bulk or in recycled containers. Food is regional and organic to the maximum possible. All scraps will be composted. Food is preserved by Sunfrost refrigerators, solar dehydrators, root cellars, and canning. Because the meat industry causes great contamination of soil and water and wastes land and grain, ecovillagers eat vegetarian. Food is cooked with solar/ wind/ hydroelectric. Food imports are selected according to ecological and labor practices. Flexible arrangements for cooking and eating alone or as family or larger group are provided. Because human population growth threatens to devour the earth regardless of wealth distribution, ecovillagers have one or fewer children per couple. There are no pets. Work: Small shop production features handmade, durable, practical goods made from regional materials, with nontoxic processing, requiring the least possible fuel to manufacture. Tools are pedal- and hand-powered, with wind and solar electric. Cogeneration is installed if natural gas is used. High-efficiency wood stoves may be used if woodlots are coppiced. Ecological cottage industries include beekeeping, plant fiber clothesmaking, solar dehydrators, organic food harvest and processing, greenhousing, herb and spice preparation, home-schooling, ladybug propagation, medicinal plant preparation, musical instrument building, reed fiber papermaking and soy ink printing, repair and efficiency, upgrade of appliances, village restaurant, spinning and weaving, pedal and hand tool making, tours of village, toys, willow ware furniture, woodcarving, and wildlife rehabilitation. Ecovillage industries requiring greater fuel input include bike and human-powered utility vehicle assembly, ceramics, compost toilets, and other pedal tools. Because federal expenditures damage the environment, ecovillagers earn less than taxable income. Clean: Main cleansers are vinegar from orchards and bulk baking soda. No commercial soaps are used. Polish is a mix of vegetable oil and lemon juice. Plant extracts provide disinfectants. Brooms and carpet sweepers are used rather than vacuum cleaners. In order to minimize groundwater disturbance and energy use, by wells and pumping, roof cisterns for gravity-fed solar-heated washwater are installed. Greywater serves to water gardens. Carousel compost toilets and low-flow showers and faucets further reduce water consumption. Play: Creative action and reflection are encouraged. New Games teach cooperation. Playfields are rotated to reduce erosion. Nontoxic and nonviolent toys are available. Sleep: Walls are fully soundproofed, with window soundproof option. Bedding is made of local fibers. Outdoor camping takes place upon raised racks. Noise limits are respected. Heal: Health is promoted with clean food, clean water and air, friendship and purpose, and time to relax and be alone. Fasting, naturopathy and hers help healing. Barter agreements are made with a medical doctor. Clothe: Garments are made of regional natural fibers such as milkweed, cattails and hemp, combed fur from uncaged angoras, or wool from sheep not raised for meat. Recycle: The extraction, manufacture, distribution, and disposal of all the goods used by ecovillagers define their ecological integrity. Therefore, an ecovillage is a zero-garbage, zero-waste community. Nothing is thrown away; everything brought to the village is recyclable. Ecovillagers enjoy life more by creating than by consuming. Move about: Footpaths minimize compaction of soil by deep mulching or erecting raised plank walks, especially over wet ground. Any essential paving is permeable – no asphalt or concrete – and used by HPUVs only. Wheelchair access is assured. Short grass, wildflowers, deep mulch, and moss are widespread in order to avoid mowing. Preferred access to and from an ecovillage is by footpath, bike path, solar electric (or sunflower oil) shuttle van, and rail. Maximum village/ regional barter minimizes dependence on transported products. Shelter: Buildings are south-facing on piers, or below ground with roof earth berms. Earth and other insulation is maximized, as is passive solar heating (including body heat) and cooling. Aerogel windows are installed. Desks and workbenches are located by windows. Solar fluorescent lamps and solar lanterns are used, with timers or heat sensor switches. Housing is clustered to share soundproofed walls, thus minimizing land area used for dwelling while maximizing both privacy and social access. Group housing offers an example of ecological urban density and the retrofit of suburbs, and it is more affordable. Land is held by a land trust, with limited equity co-op ownership of dwellings, subject to a lifestyle agreement. The way this ecovillage paradigm can be – and is already being – applied to large American metropolises was illustrated above in my discussion of a new design toolbox for Los Angeles. It is also embodied in the more recent launch, in North Philadelphia, of a green urban model project called Logan Orchard and Market, with whose design I’ve been closely involved. The Logan Triangle is North Philadelphia’s notorious 35-acre vacant space, where 997 homes were torn down twenty years ago. Built on loose coal ash forty feet deep, the homes tilted and cracked. Therefore, the Logan Orchard and Market (LOAM) proposes to create a major green city model, while meeting basic needs of Logan neighbors for fresh food, affordable housing, health care, work, and fun. To do these, LOAM would fill the land with light weight structures suited for this land, featuring 100 greenhouses and 300 solar cabins (a.k.a. elder cottages or “tiny houses”) for veterans, returning citizens, young families, or professionals. Other key components will include orchards, parks, playgrounds, market pavilions for local food and crafts, and the Patch Adams free clinic. LOAM would likewise be a regional nursery for edible perennials. Because the unemployment rate among Logan neighborhood males is 50%, LOAM will offer priority job training horticulture, landscaping, orchardry, floriculture, solar construction, and so forth. Priority housing would become available to Logan veterans, returning citizens, young families, seniors, teachers, and artists who would help manage the land. LOAM intends to begin by installing a pocket park and then expand from there. Across Loudon Street from the Triangle lives Ralph Brogdon, who says, “There are thousands of young men roaming around here with nothing to do. This will start to repair the neighborhood.” His son Ralph Brogdon Jr. is a government worker and permaculture/ agriculturalist. “Learning green skills not only in agriculture/ aquaculture/ high tunnels, but as a technical aspect such as solar and wind generation, will add much-needed job skills for the neighborhood and the Philadelphia area.” I drafted the LOAM proposal. We’ll start small and grow like a coral reef of beauty and plenty. As we proceed we’ll attract grants, volunteers, in-kind donations, and even print our own credits. Section 1 is closely adapted from the introduction to my 1982 book, Los Angeles: A History of the Future, available for purchase at http://www.paulglover.org/lahofbook.html. Section 2 is closely adapted from a text I wrote in 1990 as the Ecovillage at Ithaca was being planned. Section 3 is adapted, with some editing, from a portion of LOAM’s press release of June 22, 2015, which can be read in full on http://paulglover.org/loam.press.html. I first came across Paul’s work some 20 years ago – it only gets better with age. Thanks Paul- – it’s briliant. Michael, we met 31 years ago. You steered me back to community exchange. Thanks! A lot!